Now I have retired from my Cafe I think its time I released my secret Rock Cake recipe. I used to sell massive amounts of these mostly before they had even got out of the oven, the smell would waft out of the door and the customers would come. 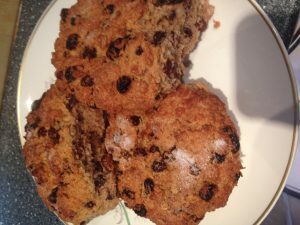 This recipe will make 8 massive Rock Cakes or 12 smaller ones your choice. add to mixture and mix in well, add a tad more milk if needed but dont make mixture too wet. just enough to stick together. make into 9 balls pop on baking tray flatten sprinkle with cinnamon sugar and cook at 180-200c degs for about 40 mins. check at around 30 mins to see how its going. leave to cool then serve. Can be split and buttered for a treat.